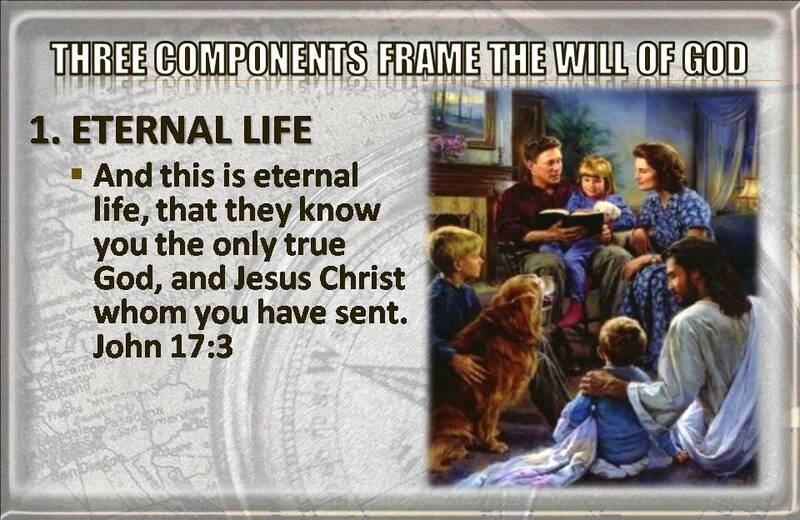 Jesus defined eternal life for us. It is not a prayer you make, nor religious activities you may do. It involves a relationship- “and this is eternal life, that they know you the only true God, and Jesus Christ whom you have sent. John 17:3. Eternal life involves KNOWING God and His Son Jesus Christ. Not one or the other. BOTH must be known. Know the Will of God will always involve knowing Him, and as such will always involve having eternal life. 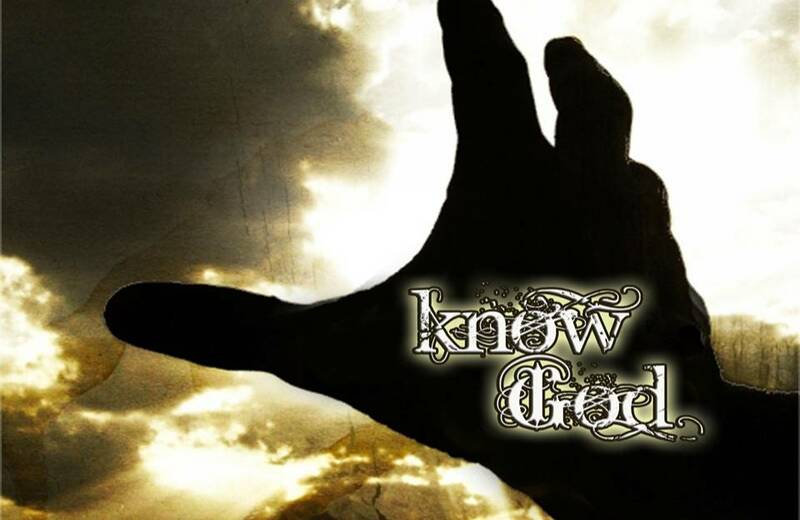 To Know God’s Will You must Know God. To Know God you must have Eternal Life. To have Eternal Life, you must know God. To know God’s will is to know God. Both of these verses are found in prayers of the Apostle Paul. So overwhelmed was he that as he was writing, he was moved to prayer for those who would be reading his letters. He wanted them to know that in Jesus Christ is all wisdom. He prayed that God would open our eyes to see this by giving us the Spirit of revelation in knowing Jesus Christ. In order to know Jesus we must walk in Him. He must be the focus of our life, our learning, our everything. Living in the Will of God will always involve walking in Jesus Christ. Living in the Will of God will always involve KNOWING Jesus Christ. This is how we have WISDOM, for Jesus Christ is our WISDOM! Wisdom is “seeing Life from God’s Point of View.” Knowing God’s Will will always involve seeing Life from His point of View. After all, it is His Will! Wisdom will always involve more of Jesus Christ in your life, for in Christ are hid all the treasures of wisdom and knowledge. Jas 1:5-8 If any of you lacks wisdom, let him ask God, who gives generously to all without reproach, and it will be given him. But let him ask in faith, with no doubting, for the one who doubts is like a wave of the sea that is driven and tossed by the wind. For that person must not suppose that he will receive anything from the Lord; he is a double-minded man, unstable in all his ways. You must want to see life from God’s point of view badly enough that you are willing to take your eyes off yourself, take your eyes off this world and focus your being on God and what He has for your life. If you ask for wisdom, if you ask to live in God’s will, yet part of you wants this or wants that, contrary to God’s righteousness, then you will not get wisdom from God. You will not see life from His point of view. You will continue to be like the waves of the sea, tossing to and fro, wandering apart from God’s will. 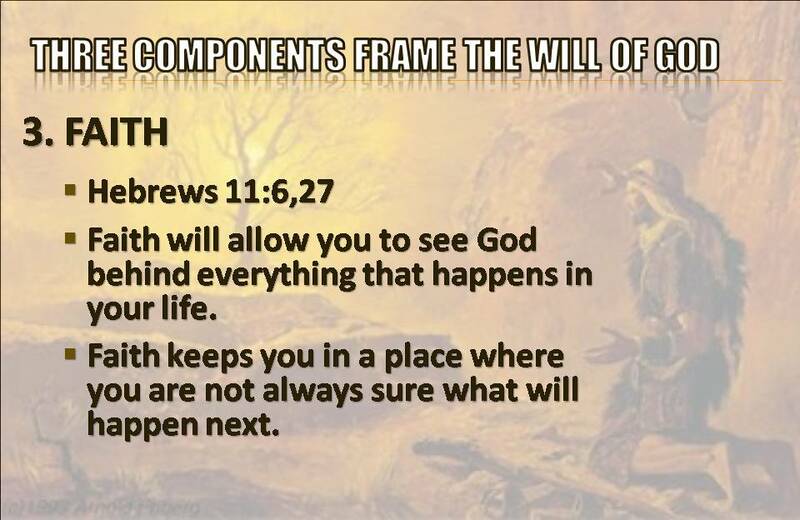 Wisdom from God and knowing God’s Will requires the same desire-a Life that is in Jesus Christ. Jesus Christ and His righteousness must become the Love of your life, the desire of your heart and soul. If you are still self-focused and concerned only for your life, why should God direct your life? After all you only want Him to benefit you! But remember, God’s Will is ALL ABOUT HIM and what HE wants! Living in the Will of God involves pleasing God. And Hebrews 11:6 says without Faith it is impossible to please God. By faith Moses left Egypt, not being afraid of the anger of the king, for he endured as seeing him who is invisible. Hebrews 11:27. Faith allows us to See God and what He wants to do with our lives. Faith will allow you to see God behind everything that happens in your life. Faith keeps you in a place where you are not sure what will happen next. 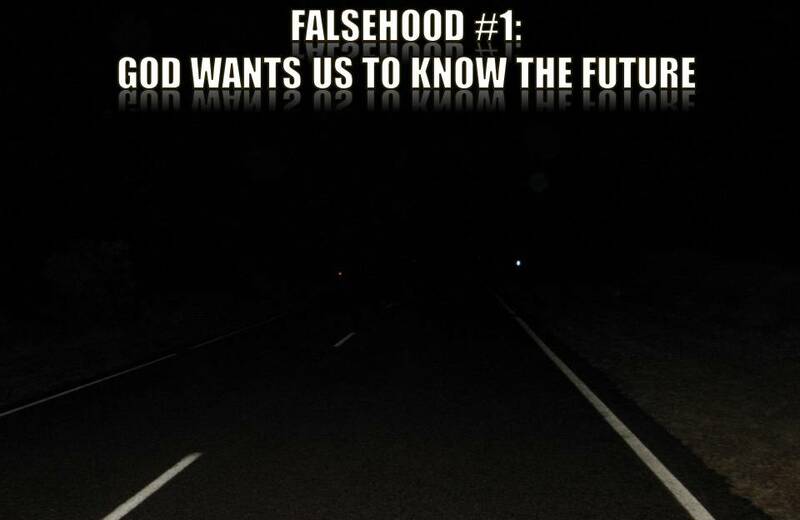 If you can see the road ahead you don’t need to Trust God. Living in the Will of God will always involve eternal life, wisdom and faith. This is the biggest mistake we Christians make with regard to living in the Will of God. It is rarely God’s will for you to know your entire personal future. God doesn’t light the entire road. He promises just enough light for your step ahead. The ancient Jews would carry small oil lamps that gave off one foot power of light. That meant they only had enough light to see one step in front of them. To see the way, they had to take a step. The light would then reveal the next step. This verse pictures a man in total darkness walking along a dangerous trail. There is no moon in the sky. Darkness clings to him. 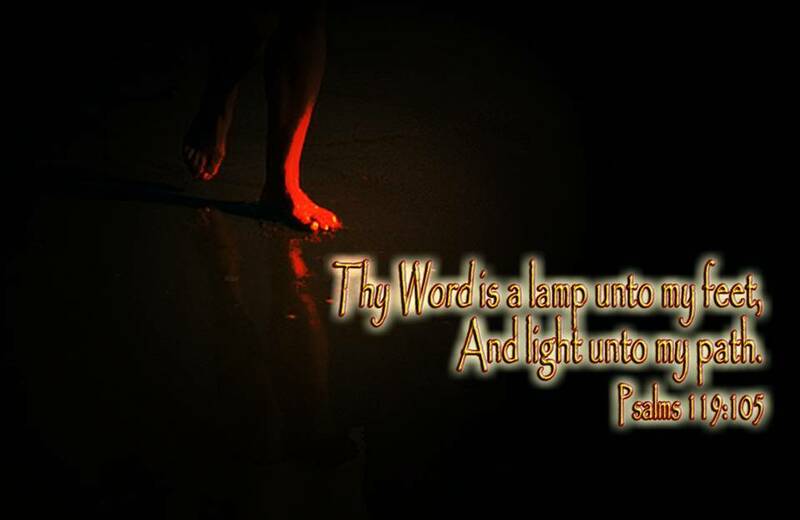 His only light comes from the lamp he carries with him. When he takes that step, what happens to the light? It goes forward one more step. The light is not bright enough to illuminate even ten feet ahead. Let’s face the truth–we want to know the future. At least we think we do. We want to know what is going to happen next year, so we can be ready in advance. But God doesn’t play that game with us. The Bible says, “The secret things belong to the LORD our God” (Deuteronomy 29:29). Does he know what will happen tomorrow? Yes, he does; but he’s not telling anyone else about it. Or to put it in familiar terms, does God have a blueprint for your life? Yes, he does; but there is no blueprint room where you can go to get a copy! Suppose God were to offer you a folder with the details of your life (and for your loved ones also) for the next 10 years. Would you take it? You first impulse might be to say yes. But suppose I add this provision. You can’t change anything you find in that folder. Would you still take it? I can tell you that I would run the other way. Life is much better lived one day at a time. Does God know what you should be doing on January 17th, 2020? Yes He does. But all you get to see is January 17, 2010. God wants us to trust Him for each and every STEP we take. Jesus said to pray for our DAILY Bread. He reveals His will one step at a time, so we must trust him moment by moment. Many people believe they must be 100 percent certain of God’s will before they make a decision. I can understand their thinking. After all, if you are facing a life-changing decision–a potential marriage, a cross-country move, a new career, which college to attend, whether or not to begin chemotherapy–you’d like to know in advance beyond any doubt that you are doing what God wants you to do. There are two problems with this point of view. 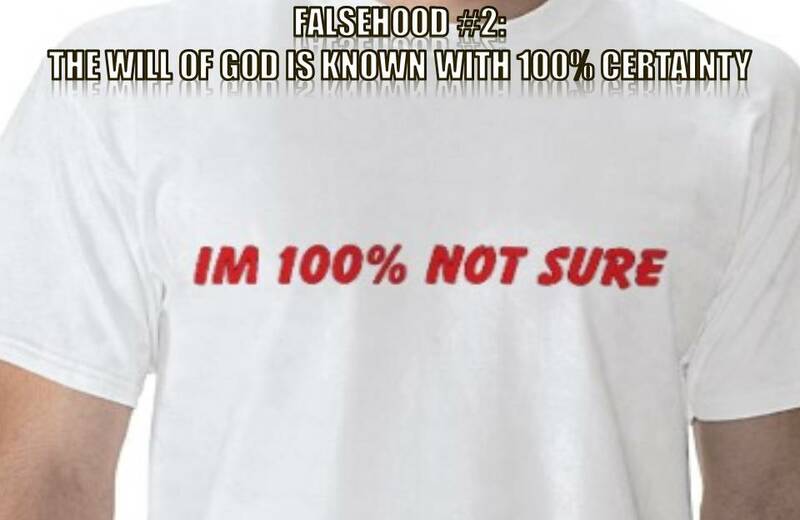 First, sometimes we think we know God’s will with 100 percent certainty only to find out later that we were mistaken. Second,becasue we believe we must be 100% sure, we end up paralyzed into inaction. We are afraid to do anything, so we end up doing nothing. Some people live by the creed: “When in doubt, don’t.” So much of doing God’s Will requires simple obedience without total understanding. Every great Hero of Faith faced a time in their life when they obeyed God without 100% certainty of the outcome. I have always been challenged by Abraham who immediately obeyed God’s command to kill his son Isaac. The scripture says that he knew God could raise him up, but I can imagine there was doubt haunting his mind as they trekked up the mountain. He obeyed, and it became righteousness to Him. So many of my mistakes and failures resulted in my righteousness as I turned to God in total dependence. If I had not failed I would still be that arrogant, self-centered snot-nosed kid I was in my early twenties. God’s mercy is so great! We see this principle illustrated in Acts 16. When the Apostle Paul and his team left Troas, they sailed across the Aegean Sea in response to a vision of a man saying, “Come over to Macedonia and help us” (v. 9). When they got there, they found a woman named Lydia. But what about “the man”? He was nowhere to be found. Later on Paul and Silas were arrested, stripped, flogged, and thrown in jail. That night during an earthquake, they led their jailer to Christ, then baptized him and his whole family. The next morning Paul and Silas were released and escorted out of the city by the town leaders, who were glad to see them go. It’s a strange story. In many ways it appears that Paul failed in Philippi. After all, he was in trouble almost from the moment he arrived. 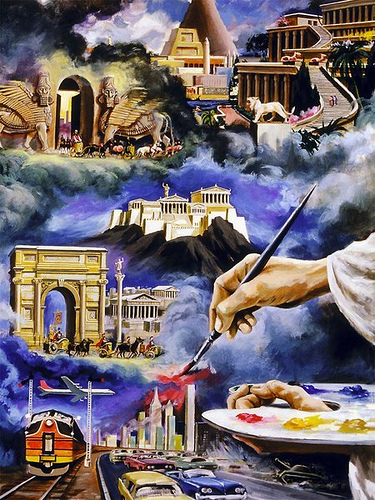 Where is the great church he came to establish? 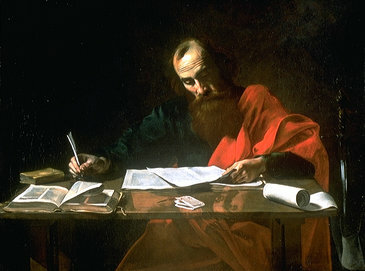 But from God’s point of view Paul did exactly what he should have done. He followed God’s leading–God gave more light–Paul took another step and waited for further developments. Step by step, through twists and turns and unexpected means, Paul did what God wanted him to do, even though it wasn’t what he expected to do when he arrived in town. 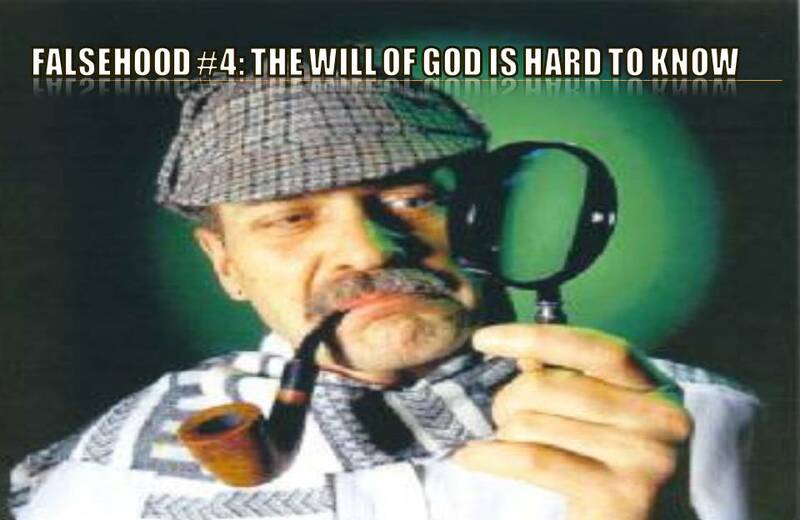 Seeking God’s will has never caused me much difficulty in the past (partly because I didn’t always! ), but when we were in the throes of trying to decide about buying this house, we both prayed long and hard that we would have a clear sense of direction and guidance from the Lord or at least a sense of peace about a decision if it were the right one. Because of the many troubles we’ve had while living here, I had convinced myself that we made the wrong decision and were paying for it in a big way. Resentment started to taint my relationship with God. Why would He allow us to make such a terrible mistake (expensive one too!) when we spent so much time asking Him for his guidance? Only in the last few weeks have I felt that God does indeed want us here. Our difficulties in getting in here were not God slamming the door shut, but rather him holding it open just wide enough for us to squeeze through. 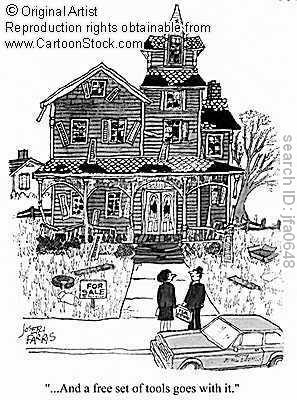 Our difficulties in buying the house now seem like good training for the battles while we’re in it. 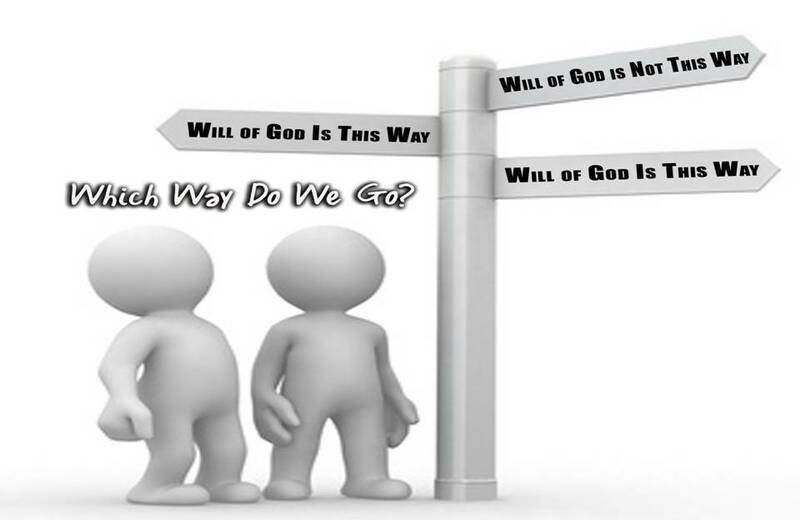 I have discovered that the outcome of our decisions does not retroactively affect whether it was God’s will! That final sentence is crucial. “The outcome does not retroactively affect whether it was God’s will.” That’s exactly right. Doing God’s will means taking the next step–whatever it is–without a definite promise about the end result. Many times you won’t have 100 percent certainty; but when the moment comes to decide, you must make the best decision you can, trusting God for the results. Sometimes you’ll know more, sometimes less; but living by faith means taking the next step anyway. The French have a word for that kind of thinking: BullCrap! 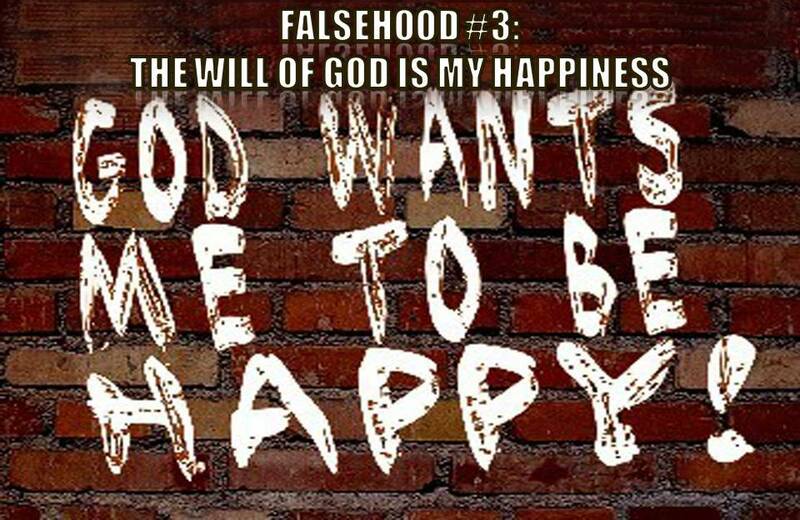 If your personal happiness is not God’s highest goal for you, then what is God’s will for your life? It is God’s will for you to be holy. It is God’s will for you to be conformed to the image of Jesus Christ. It is God’s will for you to do good works for the kingdom of God. First Thessalonians 4:3 states God’s Will very plainly: “For this is the will of God, your sanctification.” To be “sanctified” means to be made holy. It refers to the life-long process whereby God shapes you, through a myriad of experiences both positive and negative, into the image of Jesus Christ. Here’s the Bullet Point: He uses the very worst things that happen to us in order to conform us to His Son. Romans 8:29 says, “Those God foreknew he also predestined to be conformed to the likeness of his Son.” That is the will of God for your life. He wants you to become like Jesus Christ. Whatever makes you like Jesus is good. Whatever doesn’t make you like Jesus is bad. And God is fully committed to shaping your life day by day into the image of the Lord Jesus Christ. Looking back across the years of my life, I can see the working of a divine pattern which is the way of God with His children. When I was in a prison camp in Holland during the war, I often prayed, “Lord, never let the enemy put me in a German concentration camp.” God answered no to that prayer. Yet in the German camp, with all its horror, I found many prisoners who had never heard of Jesus Christ. If God had not used my sister Betsie and me to bring them to Him, they would never have heard of Him. Many died, or were killed, but many died with the name of Jesus on their lips. They were well worth all our suffering. Faith is like the radar which sees through the fog—the reality of things at a distance that the human eye cannot see. How can going to a prison camp be the will of God? It can’t be if God’s will is that you should always be happy and comfortable. Yet going to a prison camp can be the will of God for you if it makes you more like Jesus Christ and gives you opportunities to share the love of Christ to people that would never hear it otherwise. That’s the biblical perspective. Will God’s plan for you and me always bring immediate worldly wealth and success? No, but God’s plan will always bring peace and joy and fulfillment, even in the midst of sorrow and suffering. Our duty is to follow the Lord wherever he leads us. And when we do that, we find a deep joy in him. The path of obedience leads to a joy the world cannot match. Many folks think God’s Will is something you have to go to the Oracle to discover. Only after this journey or that experience. My brother who has struggled with drugs most of his life always used to say “If only God would give me a sign.” It was like he wanted a bolt of lightning to strike him before he would get his life right with God. Some people want a visible message from God. Like a God Postcard that reads, “Dear John, Buy the White Toyota. Signed, God.” Or they fear that one night, while they are watching Monday Night Football, God’s will flash His Will across the TV, but we missed it because of a potty break. Or they worry that they have sinned too much and have blown their only chance to do God’s will. God doesn’t operate that way. He simply says Trust Me, Know Me. Wait on Me. God wants you to know his will more than you want to know it. God is more committed to showing you his will than you are to discovering it. When you give your will to Him, he will take complete responsibility for getting you from here to there step by step. God has said, “Never will I leave you” (Hebrews 13:5). And He won’t. He also said, “I will instruct you and teach you in the way you should go” (Psalm 32:8). And He will. He also promised, “Surely I will be with you always” (Matthew 28:20). And He is. We think that God’s will is hard to find. The biblical perspective is quite different. God will reveal his will to anyone who is willing to do it. Sometimes He makes us wait. But He will always show His will to those willing to do it. God will usually show you His will and expect you to do it, because you told Him you would. He doesn’t give you choices. There is no Plan A or B or C. He doesn’t say, what do you think of this and allow you to say maybe I will or maybe I won’t. Do you have another plan God? This one looks too hard. HE WILL SHOW YOU HIS WILL WHEN HE KNOWS YOU ARE WILLING TO DO IT. “Workman of God! O lose not heart, But learn what God is like; And in the darkest battlefield Thou shalt know where to strike. Nothing will sustain the servants of the Lord in hard times like knowing God’s character. And as the hymn (and life itself) makes clear, you don’t “learn what God is like” by going to seminary and memorizing the attributes of God. You learn what God is like in the darkness of the night, when you feel overwhelmed and burdened and full of fear and uncertainty. Ironically you learn that when you feel most alone, God is nearest to you. So make it your goal in life to know God. Remind yourself of his justice. Linger at the foot of the cross. Pray the psalms back to him. Be silent before his judgments. “He knows the way that I take; when he has tried me, I shall come out as gold” (Job 23:10). My Abba Father knows the way that I take even when I don’t. My Abba Father knows the way that I take even when I can’t see clearly. My Abba Father knows the way that I take even when I get lost. This prayer is powerful because it doesn’t change anything outside of you, but it will enable God to change everything inside of you. Your circumstances won’t change, but your attitude will. Your heart will start to listen to God. Your eyes will begin to see Him in your circumstances. 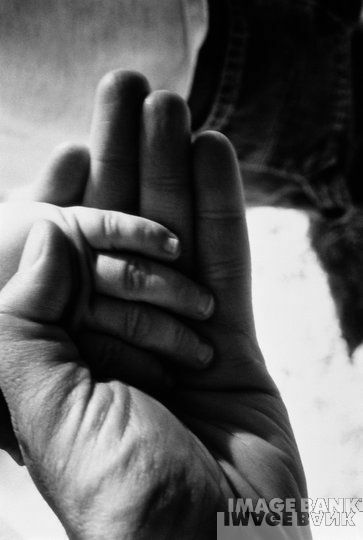 You will find yourself beginning to know Him as your “Abba Father”, your dear loving daddy. And He will always guide those who hold His hand. 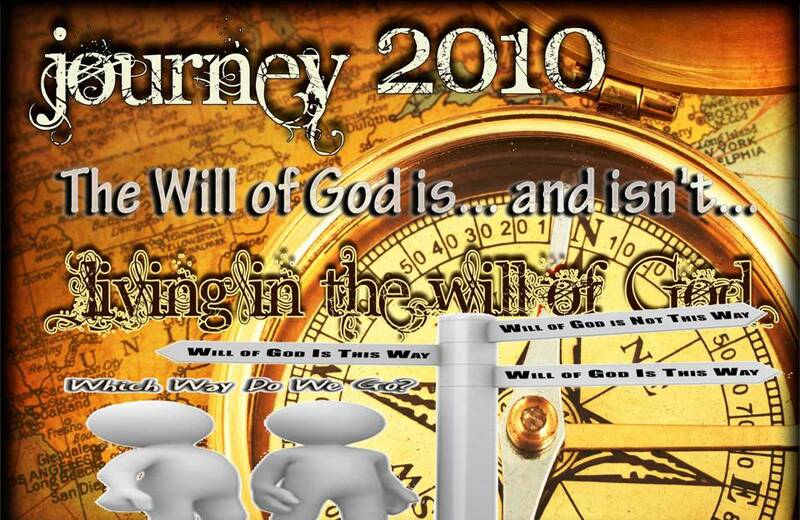 Are you ready to Journey with God in 2010? Why don’t you tell Him right now! God’s will for my life always seems to come from someone else’s mouth.